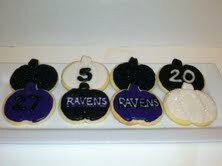 Sweet Eats Cakes: Football Season and Giveaway Winner! So, it's football season, and that means Sundays spent on the couch eating cookies and drinking beer. Ok, well maybe most people don't eat cookies with their beer, but if you live in my house you do. 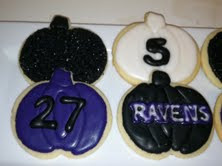 So since it is Fall I thought that football themed pumpkin cookies would be appropriate. 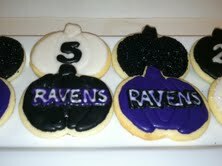 I loved the way the cookies came out, and am very happy that the Ravens are purple and black, because if they were say red and gold, I don't think the pumpkins would look nearly as cute. 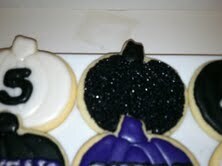 I especially love the cookies with the sanding sugar on them. 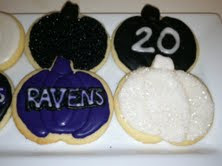 Full disclosure: The Ravens are not actually my favorite team, but don't tell any Baltimore fans that! On to the thing you have all been waiting for...well some of you have been waiting for anyway. The cookie giveaway! I will be in contact with you to get your cookies sent out! I hope you enjoy them, and thanks for entering!